To me, roast chicken is the ultimate soul food. When you cut into it and steam curls its way out… Appetising and hearty, this chicken recipe is topped with a creamy dijon and thyme sauce. It’s melt-in-your-mouth, swoon-all-the-way-to-the-last-bite kind of food. A perfect autumn treat. How about a bit of an escape from the dreary autumn weather? This spicy, sweet chicken tagine recipe with the crunch of almonds and fluffy cous cous will transport you to the Souks of Morocco in no time. With authentic Moroccan flavours like Ras-El-Hanout, mint and red chilli it will warm you right up. Fancy some more South Asian chicken recipes? We have a great Malaysian chicken recipe for you! Have you heard of Pandan? It’s a leaf that’s indigenous to South Asia and it adds a great flavour to rice! Try this succulent chicken recipe – super nutritious and delicious! Even though curry hails from the shores of India, the UK is famed for having a lot of love for the stuff. As one of our favourite dishes, we couldn’t leave out this mouth-watering chicken tikka masala recipe. For those days, when you need a boost – give this dish a go! My favourite thing about this chicken dish, is the subtlety of the flavours. It’s perfectly seasoned and spiced, but without being potent. Great for kids! Sticky barbecue chicken is a huge hit in the summer months. For autumn, we’ve kept the sticky, sweetness of the barbecue but with the more comforting marmelade tang. Our sticky marmelade chicken recipe is a winner with rice, carrots and courgettes by it’s side. Lentils are packed with flavour and protein! They are a great way of adding depth to your veggies. 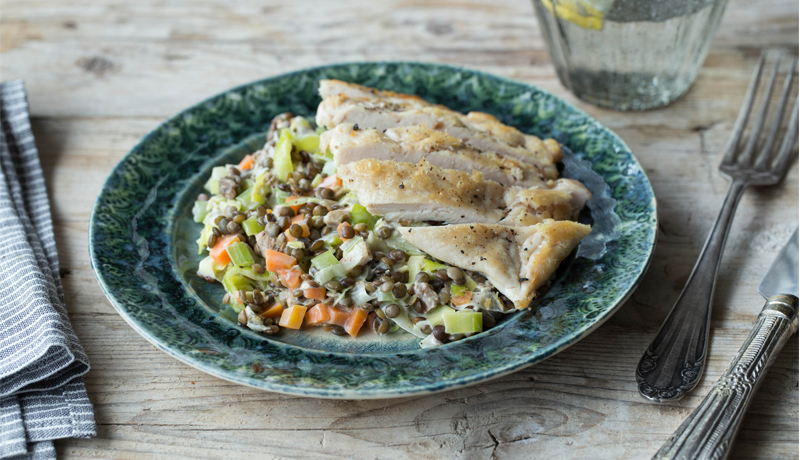 Give our chicken and lentils recipe a try to spice up your normal routine. Here’s one for the Spanish food lovers. We love chicken. We love chorizo. So, we thought, why not combine them? Our Chorizo crusted chicken recipe proved a massive hit, if you haven’t tasted it already – you should! Of all the awesome autumn chicken recipes – this one has been the most popular! There is something about eating chicken with your hands that makes it taste even better! It looks pretty fancy with the skewered chicken and yet it’s so simple to make and so delicious to eat! Try our chicken yakitori recipe – it’s number 1!